Stay at Agustin Inn and watch the fireworks from right in front of the Inn or walk one block and watch from the Fort grounds or the Bayfront. Holidays are built around traditions and few holidays have more great family traditions than the Fourth of July: great food, outdoor band concerts, a day with friends and family, and of course, fireworks! They all come together in a grand celebration and there’s no better place to celebrate Independence Day than in the Nation’s Oldest City. 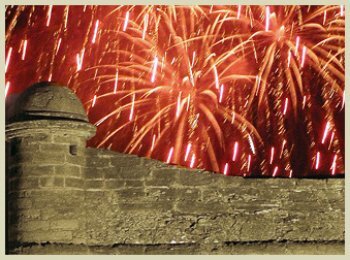 Fireworks over the Matanzas, the highlight of St. Augustine’s traditional July 4th activities has become synonymous with celebrating Independence Day in the Nation’s Oldest City. The spectacular aerial display of pyrotechnics high over Matanzas Bay begins at 9:30pm. The 20-minute display is tightly choreographed to a stirring soundtrack of great popular music delivered over an extensive sound system transforming the entire Bayfront between the Castillo de San Marcos National Monument and the Bridge of Lions into a theatre of sight and sound. Since July 4th falls on a Sunday this year, it is expected that many people will remain downtown at the conclusion of the show for a late dinner or to visit the shops that have learned the value of extended hours after the fireworks. Given the choice between spending time strolling downtown with friends and family or sitting in traffic wasting gas, more and more people are taking their time.